CLC provides community supported living services to adults with developmental disabilities who live in their own homes, in Dane County. We respect each person's unique contribution to their community. We ensure person-centered supports that emphasize dignity, respect and independence. Our services aim to connect individuals with their community and help them reach their full potential. Community Living Connections, Inc. is a local, non-profit agency founded in 2004. 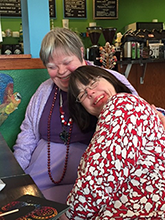 CLC currently provides community supported living services to approximately 200 individuals who live throughout Dane County, primarily in Madison, Stoughton and Mt. Horeb. Our organization provides support that enables people to live in their own homes and participate in community life. We believe that individuals with disabilities deserve equal opportunities to create their "best life"; they just need additional support in order to do so. Community Living Connections provides in home staff to help with planning, personal cares, medical support, finances, relationship building…etc. We work in partnership with people throughout their lifetime. The success of our organization is measured by the individual successes of the people we serve. Adults with developmental disabilities living their dreams, traveling, buying their own homes, getting married, working, owning a business - choosing and directing their own lives. Successes that are helped made possible by the dedication and commitment of the people who work here. Paid Training – In homes and in the classroom. Employees are encouraged to take advantage of all the training opportunities CLC offers. Casual Environment and Flexible work schedules. Employee Referral Bonus – One of CLC’s best resources for new staff is the recommendation of our current employees. 401(k) Plan – All employees have the ability to set aside pre-tax money for their future planning. CLC provides a match after 2 years of employment. Health Insurance – CLC provides an HMO plan through Unity Health Insurance with no deductibles, or coinsurance. There are minimal office visit co-pays and hospitalizations are covered at 100%. CLC contributes 75% of the cost for single coverage and 65% of the cost for family coverage. Dental Insurance – CLC provides Dental coverage through Delta Dental. Diagnostic and preventive services are paid at 100%, Basic and major services are covered at 80%, after deductible, and Orthodontics are covered at 50% after deductible. CLC contributes 75% of the cost for single coverage and 65% of the cost for family coverage. Life and Long Term Disability Insurance: CLC pays 100% of the cost. Voluntary Plans that employees may choose at their expense. Plans include Critical Illness, Accident, Short Term Disability and Additional Life. Thank you for your interest in a career with Community Living Connections and the opportunity to positively impact lives! Community Living Connections is a progressive organization that values all of its employees and promotes a work/life balance through a flexible, casual, friendly work environment. While experience can be helpful in this profession, there is no experience level required for employment. Training for all support needs is provided on site and paired with supplemental classroom trainings.